Vancouver, January 22, 2018 - Freegold is pleased to report the final results of the outstanding assay results from its 2017 drill program at Shorty Creek. Results continue to confirm the size potential of this large porphyry project. Hole 17-05A intercepted another broad zone of copper mineralization of 165 metres grading 0.60%Cu equivalent*. Located 125-road km northwest of Fairbanks, Alaska (population 100,000), Freegold acquired Shorty Creek in 2014, believing that Shorty Creek had the potential to host a significant copper porphyry system. In 2015, Freegold commenced its first drilling (3 holes) at Hill 1835 with the objective of testing both the ground and airborne geophysical anomalies, and to determine if the mineralization extended beyond the 150 metres depth drilled by Asarco in 1989-1990 while exploring for gold. Twenty-five years later, Hole 15-01 successfully intersected copper mineralization beyond the depth of the limited previous Asarco drilling. Hole 15-02 intersected the pyritic halo outside the main magnetic feature, and hole 15-03, not only discovered significant copper mineralization, (91.4 metres grading 0.81% Cu equivalent*) but also demonstrated that the copper mineralization was associated with the magnetic high at Hill 1835. The magnetic feature at Hill 1835 covers a 700 metre by 1,000-metre area. 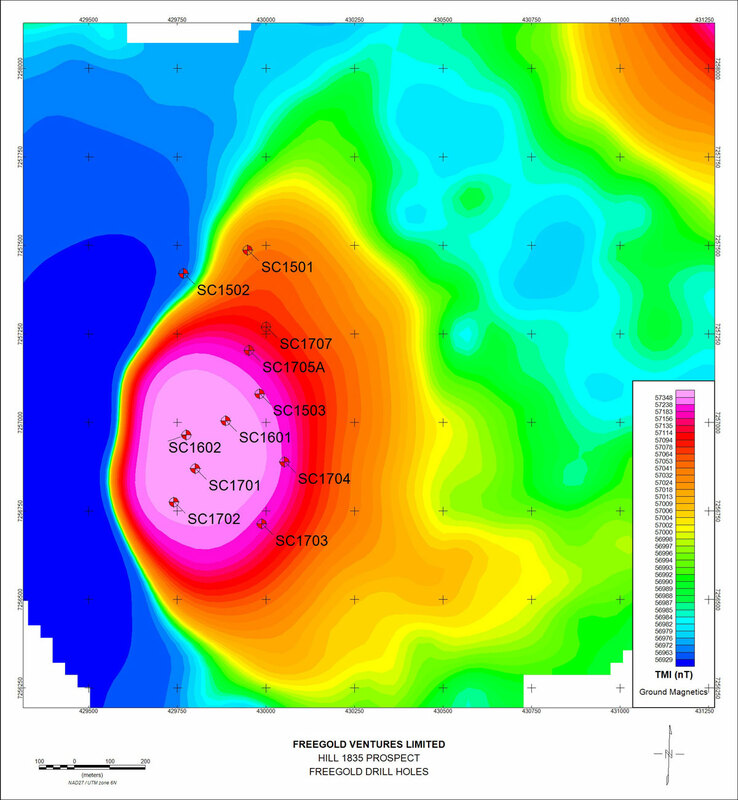 Drilling in 2016 (2 holes) at Hill 1835 continued to demonstrate the association of copper mineralization with the magnetic high at Hill 1835 and also successfully intersected mineralization to a depth of at least 520 metres, (Hole 16-01 – 434.5 metres grading 0.64% Cu equivalent*) and (Hole 16-02 – 409.5 metres grading 0.49% Cu equivalent*), demonstrating both the size and tonnage potential of Hill 1835. Drilling was also carried out on Hill 1710, an area located 2.5 kmnorthwest of Hill 1835. Five holes were drilled, each spaced 400 metres apart. Although grades intersected were not economic, each hole intersected strongly anomalous copper mineralization throughout the entire hole with copper grades increasing as the drilling moved to the northeast, further confirming the size potential of the mineralized system at Shorty Creek. Drilling has only tested 1.2 km of the 6 km long magnetic feature present at Hill 1710. The 2016 program also consisted of additional ground magnetics, soil sampling and staking, which resulted in the identification of two additional target areas within the 100 square kilometer project area. In 2017, Freegold drilled five additional holes at Hill 1835. These holes continue to be significant step outs (average 100 metres) with the results continuing to demonstrate the size and grade potential of Hill 1835. Both holes 17-01 (360 metres grading 0.42% Cu equivalent*) and 17-02 (339 metres grading 0.46% Cu equivalent*) intersected broad zones of copper mineralization consistent with the results of the 2016 drilling in addition to significant by-product credits of gold, silver, cobalt and tungsten. See attached map for hole locations. Holes 17-03 and 17-04 were both angle holes drilled on the eastern edge of the magnetic high. Hole 17-03 averaged 0.47% copper equivalent* over 105.2 metres and was lost at depth of 362 metres. This hole is expected to be completed during the 2018 program. Hole 17-04 encountered substantial faulting throughout the entire hole with both gold and copper values increasing at depth. Hole 17-05A was collared 125 metres north of Hole 15-03 and was aimed at testing both the northern portion of the magnetic high and the potential for gold mineralization in the area surrounding the magnetic high. Hole 17-05A returned 165 metres grading 0.60% Cu equivalent - (0.29% Cu, 0.18 g/t Au, 6.81 g/t Au and 135 ppm Co). Hole 17-07 was collared 90 metres northeast of Hole 17-05 and was completed to a depth of 41 metres before winter conditions set in rendering it impossible to complete the hole. Gold and silver values of 0.07 g/t Au and 1.7 g/t Ag respectively, were returned over the top 34 metres, and all within oxide. Hole 17-07 is expected to be completed during the 2018 field program. Drilling at Hill 1835 is still very early stage with the spacing between holes averaging 120 metres and a large untested area remaining. Considerable infill drilling will be necessary in order to define a resource, however, each hole drilled to date has intersected broad zones of mineralization, despite the wide spacing, and results continue to confirm both the grade and overall tonnage potential of this sizeable target area. In addition to the Hill 1835 drilling, one hole was completed in the Steel Creek area during 2017. Steel Creek lies 1.5 km to the northeast of Hill 1835, and is defined by a large magnetic anomaly measuring 2.0 km by 2.5 km. Hole 17-06 was drilled in the centre of the magnetic feature, and returned anomalous values. Of particular significance is the anomalous metal suite encountered within the hole, which includes copper, gold silver, cobalt and tungsten, consistent with that seen at Hill 1835. Additional drilling will be necessary to further test this promising target area. Freegold has not as yet collected sufficient data to determine how the downhole drill intervals might relate to the actual true thickness of mineralization. *Copper equivalent grades are based on metal prices of: copper US$3.20/lb, gold US$1330 per oz and silver US$17 per oz and cobalt US$34/lb. Metal recoveries have not been applied in the copper equivalent calculation. The copper equivalent calculation is as follows; CuEq=Cu grade+(Au grade x Au price + Ag grade x Ag price)/(22.0462 x 31.1035 x Cu price)+ (Co grade x 22.0462 x Co price/Cu price/22.0462). NSV – no significant values. *Tungsten - Tungsten is not included in the copper equivalent. Similar to other large-scale porphyry projects, Shorty Creek hosts an abundance of highly prospective target areas in addition to the Hill 1835 target area. Five main target areas have been identified at Shorty Creek - Hills’ 1835, 1710, 1890, Steel Creek and the Quarry. Considerable geochemical differences are present between the various target areas. The mineralization at Hill 1835 is comprised of copper, gold, silver, cobalt and tungsten, whilst the mineralization at Hill 1710 is primarily copper and molybdenum. Results from the one hole at Steel Creek indicate that the mineral suite appears to be similar to Hill 1835. Limited work has been undertaken on Hill 1890 and Quarry targets to date. Rock and soil sampling on the Quarry target returned 0.05% copper in oxidized quartz feldspar porphyry with stockwork veining. The presence of oxidized quartz feldspar porphyry with stockwork veining has not been noted on surface anywhere else on the project to date. Drill cores were logged, photographed and placed in sealed bags for geochemical analysis. Core samples were picked up at the logging facility by ALS Chemex and transported to their facility in Fairbanks, Alaska. ALS Chemex analyzed core samples via fire assay analysis for gold plus multi element ICP-AES and ICP-MS analysis using 4 acid-digestion. A series of check assays were also performed by SGS. Quality control entailed insertion of blanks and standards into the sample stream, at the rate of approximately one QA/QC sample every tenth assay. Reported standard and blank assay values were within an acceptable margin of error. The Qualified Person for this release is Alvin Jackson, P.Geo – Vice President Exploration and Development for the Company who has reviewed and approved the scientific and technical information contained in this press release. Some statements in this news release contain forward-looking information, including without limitation statements as to planned expenditures and exploration programs. These statements address future events and conditions and, as such, involve known and unknown risks, uncertainties and other factors which may cause the actual results, performance or achievements to be materially different from any future results, performance or achievements expressed or implied by the statements. Such factors include without limitation the completion of planned expenditures, the ability to complete exploration programs on schedule and the success of exploration programs. Without limitation, statements regarding potential mineralization and resources, exploration results, and future plans and objectives of the Company are forward looking statements that involve various risks. Actual results could differ materially from those projected as a result of the following factors, among others: changes in the price of mineral market conditions, risks inherent in mineral exploration, risks associated with development, construction and mining operations, the uncertainty of future profitability and uncertainty of access to additional capital. See Freegold’s Annual Information Form for the year ended December 31st, 2016 filed under Freegold’s profile at www.sedar.com for a detailed discussion of the risk factors associated with Freegold’s operations.